A GREAT CIRCLE IS defined as a direction line that forms a full circle. This is also called a true azimuth. 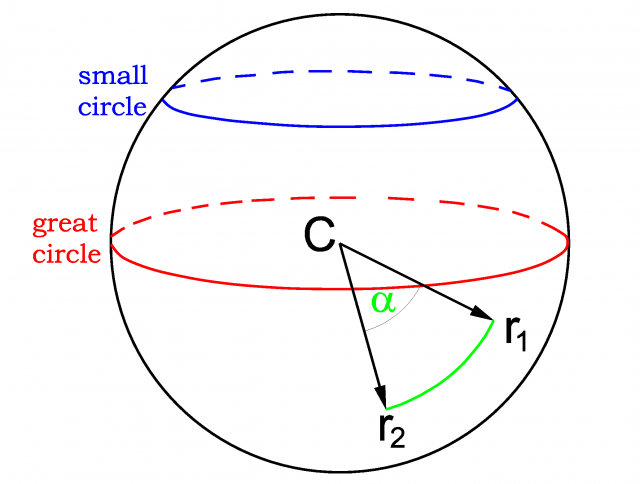 A great circle divides the Earth into equal halves and on the idealized surface of the Earth, the shortest distance between two points lies along a great circle. The equator is a great circle, as are all meridians of longitude. A great circle has a number of considerable properties. It is the largest possible circle on the globe, and every great circle has its center in the center of the Earth and its circumference is the circumference of the Earth. One of the most important uses of great circle distances is by navigators of ships and aircraft. Measuring and determining direction is different between that on the spherical earth and that of flat surface direction finding. Traveling along a great circle (called the great circle route) is the shortest distance between two places on the Earth. Air and sea transportation lines tend to use great circle routes as much as possible to save on travel time and costs. Finding distances between points on a great circle is accomplished using the known latitude and longitude of the two points and using trigonometric tables. Users of the great circle route need to select the proper map PROJECTION to display properly a great circle route. Maps distort distances so the great circle route may appear longer than a straight line on a flat map. The only map projection that portrays great circles as straight lines is the gnomonic projection. The drawback to using this projection, however, is that they cannot illustrate a whole hemisphere in one map. Other azimuthal projections are sometimes useful for navigators looking at great circle routes because of their symmetrical nature, making all great circle routes passing through their centers appear as straight lines. Another challenge appears when plotting a course using a great circle route. Compass direction along a great circle route varies constantly. To avoid constantly having to check and recalculate compass direction, followers of great circle routes can lighten their burden by following what is called a constant azimuth path. The difference between a true azimuth path and a constant azimuth path is that the true azimuth path is the shortest distance between two points on the surface of a globe and the constant azimuth path is the path followed by using a constant compass heading.